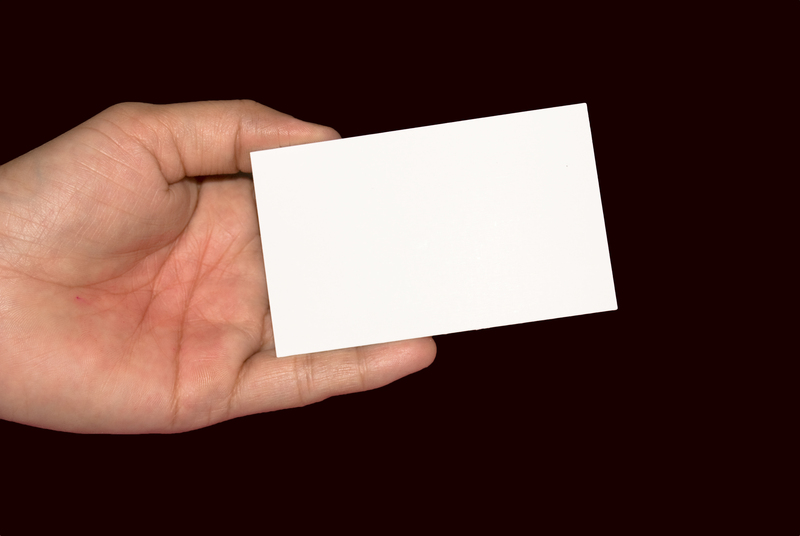 Do you have a business card as a writer or author? Have you thought about it? Business cards are a good idea with lots of uses. Just a quick tip: First, make sure your card stands out. A signature color, logo, or something that draws attention is good. Also make sure that you use a legible font and include only details you want widely public (for example, I omitted my address and phone number). One clever idea, which I will implement when the third Family Secrets novel comes out, is to use the space on one side of the card for thumbnails of three books. It’s almost a perfect fit. Then put your info on the back along with a link to where you prefer people to buy them. It’s an immediate sales tool in the guise of a business card. For non-fiction, put your cover on one side (vertical) with where to buy below and your info on the other side. Use mailing labels on the back to offer a discount code or free download. Include the URL and the code, and boldly say “half off” or “free” or “complimentary.” By using mailing labels you can switch out the codes and track results. Stick them in books as bookmarks when you sign or send them out. Put a QR code on the back and offer a free book or promotion. If you are still struggling to be discovered (as most of us are), take a box of cards with you to your next comicon type event. People stand in line forever at these things. Hand out cards with your book details to those who express interest (QR codes works great for this but be sure to include a website for the non-smart phone users). Again using the free code, write a brief personal note and hand out to your favorite waitress, carpool members, selected coworkers, and casual acquaintances. Though I’d say try to focus on people that might like your book, be generous. You never know and the six degrees of separation is an actual thing. Also, this becomes a gift rather than “buy my book,” which most folks appreciate. Take them to conferences and writers groups. Again, the more a card stands out and clearly states who you are, the better. When you meet someone you want to talk to further, write your phone number on the back along with where you met or a phrase to spark the recipient’s memory (especially useful for conferences and gatherings where business cards are frequent). Your business card is more than a networking tool. It is good will, an invitation, a gift, advertising, and promotion all rolled into one, depending on how you use it. The card is an eggshell finish with a warm dark brown. It does not scan well. 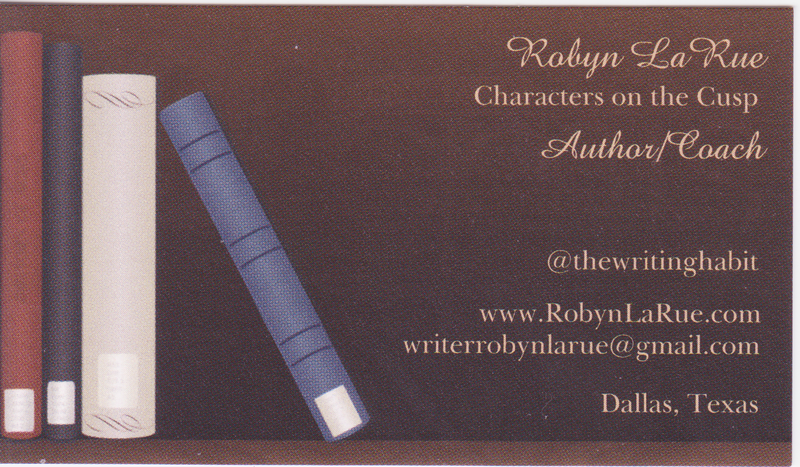 Do you have business cards as a writer/author? How do you use them? This entry was posted in Business and tagged Robyn LaRue, Tips for Writers, Writing Advice. Bookmark the permalink. I’ve had writing business cards for years, but never thought of sharing such such a post. Plus, these are such CLEVER ideas. The only addition I’d make is that at conferences, I’ve stuck a clear label on the back on my cad with my novel’s name + hook to be ready when an agent/editor said, “That sounds interesting. Send me the first 3 chapters. That way, when they got home with a hundred other cards what MY STORY was there to remind about me. Pingback: StoryDam Chat Q’s: A Little Help From Our Friends?